​The Coaching Conversation Model is a tool to explain the way a coaching discussion may at times flex into training, teaching or mentoring mode as well as the ideal coaching approach. Here leading creative sector coach Alec McPhedran of Skills Channel TV explains the model to help new coaches appreciate the skill in flexing coaching conversations. This of course is true in one sense. Indeed, that would be the perfect coaching session – I ask profound questions, the you answer them, sort yourself out, you leave happy and I send my invoice. What a life. As we develop out coaching understanding, we recognise that the perfect approach to coaching conversation doesn’t always happen. Sometimes we need to use and trust our experience and step back a bit into training mode to explain a concept and then return to coaching on how they can use that concept to develop their ideas. We may well also throw in some personal experience by way of example, which in turn means I may well be in mentoring mode. As I try to explain this to people when I deliver workshops on coaching, it managing coaching conversations can come over a bit contradictory or confusing. On that basis, and being a visual type, I developed the Coaching Conversation Model. 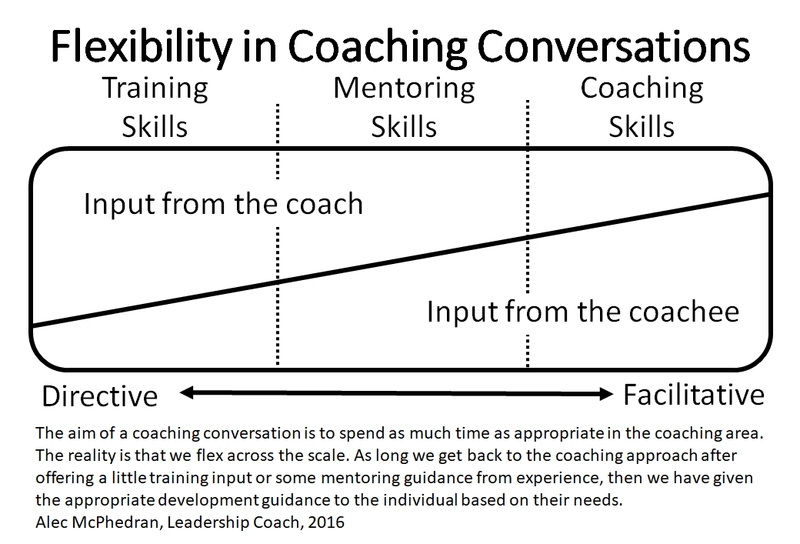 This has evolved over a number of years but what is great about the model is that it helps to initiate valuable discussions on the flexibility needed in coaching conversations. The more we instruct or influence the conversation, the less the coachee contributes to the conversation. That is directive coaching. If for example, I am trying to help a manager work through giving feedback on a colleague’s behaviour, I tend to see how they would approach it and what the likely outcomes would be based on that approach. If we agreed that it might not be the best approach or the manager was not familiar with feedback theory, I could offer some ideas on feedback theory to help move the situation forward. A typical model I use, because of its simplicity and usefulness, is the AID feedback model. That is A for action or actions I have seen, heard or felt. I is for the impact of those actions and the likely consequences and D for what should they do about it in the future. On that basis, I am in training or teaching mode using my training skills. Once I have put the theory across we then move back to a coaching approach by getting back to asking them how they could use that model in that particular situation. I am back to guiding the thinking of the coachee, not contributing ideas but simply coaching. That is facilitative coaching – the main conversation coming from the coachee. Much of this approach has strong links to Heron’s Six Categories of Intervention (1975, in Hawkins & Smith, 2006) offering approaches from an authoritative set of interventions to facilitative interventions. Heron’s models confirm that as a coach, we need to flex our approach as we work with our coachees. A frequent misunderstanding I find when coaching managers is their understanding of development. Many people feel that development means training. To me, development is how do we give people new knowledge, skills and behaviours. This widens our options with development opportunities such as coaching, mentoring, teaching, shadowing, secondment and so on. Training may or may not be a part of development. In developing the Coaching Conversations model, and for the sake of simplicity, I have used training, coaching and mentoring by way of example. You can use whatever is appropriate to your learning group with headings such as educating, teaching, facilitating. For me, the basics of training, coaching and mentoring work well. As a pre-activity to discussing coaching conversations, I run an activity in which the group is normally split in to three. Each group is allocated either training, coaching or mentoring. They then write words on a Post-It that reflects clearly their development option. They then select the top three words and create a simple sentence defining training, coaching or mentoring. During feedback and discussion, we then evolve their work in a way that explains each and differentiates the three. Before the session, they are encouraged to bring along a preferred description on coaching and mentoring. We all have our view on what each development option is but the point of the exercise is to understand those options and develop a way in which to explain them simply and clearly in a coaching session. The value of the exercise is that participants gain a better understanding of each and recognise the differences – especially between mentoring and coaching. I often support this with am anecdote that highlights those differences. In training mode, we instruct, tell. Much of the input to the conversation is from the coach. It is explaining ideas, concepts or theories. This is where the coach concentrates on the objective of the coaching session – be it coachee or jointly identified. This uses questioning, active listening, feedback, problem solving, idea generation and summarising skills to guide the coachee. It’s asking rather than telling. It allows the coachee to develop their thinking capability and self-belief in their capability. The main input on the conversation is ideally from the coachee. Coaching is facilitating the learning of others to help them reach their unique potential. A mentor is a more experienced or senior person who offers guidance, support, pastoral care or wisdom to another in developing them as a person. This is where the coach applies their mentoring skills jointly contributes to the conversation with the coachee. The mentoring approach allows the coach to offer ideas from their experiences, points ideas in an appropriate direction and guides based on their wisdom. I’m conscious that my definitions of training, coaching and mentoring will not sit well with others. In fact, when I search on a web browser for ‘definition of coaching’, it tells me if has found 233,000,000 pages with thousands of definitions and interpretations of definitions. We all have our own views, beliefs and versions of each based on our unique experiences. The key thing is you have a description in which you feel is right and it helps to explain what it is to a coachee yet it is simple and easy to understand. I also feel it must clearly differentiate between the three development approaches. The purpose of the coaching conversation model is to help a new coach understand that the conversation will flex in to the territory of teaching, training, education or mentoring but with the aim of making sure we focus on and always returning to the coaching approach where appropriate. A pure coaching session is the Utopia but in cases I have experienced, we do have to flex for the benefit of the coachee and the coaching session or programme goal. The Coaching Conversation Model has been developed by Alec McPhedran FCIPD, Chtd Mngr CMI, MAC, MCMI as a tool for people who coach; to help understand the conversation management of a coaching session. Alec is the managing director of Skills Channel TV, the training company for busy creative people. He specialises in one to one coaching, facilitated learning, media training and team development. He developed the GENIUS Coaching Model, a guide to managing the flow of a coaching conversation. For further information, contact 0121 366 87 99 or visit www.skillschannel.tv.